Mowing your lawn can be extremely tedious, especially after it has rained or it’s a hot sunny day. You have three options, you can either wait it out until the weather gets better, grudgingly mow your lawn, or purchase a robot lawn mower. But, what if I we told you there’s another way? You could buy a zero turn mower. A zero turn lawn mower is a type of riding mower that has no turning radius. This means that the mower can rotate itself in place at the user’s discretion and can drive in any direction that the user desires. Although they are typically used in a commercial setting, less-expensive versions exist for private use on smaller properties. Most models will have four total wheels with swiveling front wheels to allow the vehicle to turn in place. These wheels are typically not controlled by a steering wheel, but rather two levers that dictate both the direction and speed of the mower. Most models will move much faster than the average riding tractor and will house a much wider cutting deck. This equates to much faster mowing than any other type of mower. There are so many different types and brands of ztr mowers out there that it can become quite confusing to select the best one. For the average costumer, finding the best ztr mower can be rather difficult considering there are so many features to look out for. In order to address this issue and help consumers readily select a zero turn lawn mower for sale, we’ve reviewed the top 10 best riding lawn mowers. So without dragging any further, let’s begin by taking a look at these amazing mowers. Coming in with a free 10-year warranty for the 46” cutting deck, the Poulan Pro 967330901 P46ZX is one of the most cost efficient models available today. The company is known for its competitive pricing while still maintaining a high level of trust and quality in its products. Averaging nearly 4.5/5 stars on Amazon proves the fact that this is one of the best economical options on the market. In case you didn’t know, Poulan branded mowers are actually manufactured by Husqvarna, and that means reliability, quality, and most of all, affordability. In fact, some customers have claimed this mower works at the same level as their previous mower which was twice as expensive. This mower’s uses Poulan’s dual hydro-gear EZT transmission which is essentially their in-house hydrostatic transmission system. It delivers smooth power and precise control for all types of obstacles that you might face. The excellent transmission combined with its powerful Briggs and Stratton 22 HP engine, this mower will eat through your lawn at incredible speeds. In fact, at top speeds of 6 mph this zero turn mower will cut at rates up to 2.4 acres/hour. With features like reinforced decking, the mower is an investment sure to last. It even comes with an extensive 3-year warranty from Poulan. A well renowned power equipment company, Swisher’s ZTR2454BS follows its predecessors as yet another quality product. Entirely manufactured in the USA, this model is a serious beast when cutting grass. Everything about its design screams power and efficiency, and that’s exactly how this machine performs. Like the BMW of lawn mowers, this Swisher performs at a pleasantly exceptional level while costing much more than any of its competitors. Even with the same engine and cutting deck size as the Poulan mentioned above, this mower costs over $2000 more. With price comes quality, however, and that is a fact that cannot be denied. It mows at speeds up to 8mph both forward and reverse and can maneuver around nearly anything. This machine is a serious testament to efficiency. Not only will it mow fast, but it will also mow precisely thanks to its 3 individual gator blades. These blades mulch grass as it cuts and leaves lawns green and healthy without the need to bag or collect clippings afterwards. Thanks to a great design with proper weight distribution, the mower holds a very low center of gravity. This means more precise turns at all speeds. Another zero turn mower in Poulan’s lineup, the Pro 967331001 P54ZX is nearly identical to the one mentioned above. It too utilizes the “hydro gear EZT transmission”, and it’s deck is covered by the companies own 10-year warranty. Another model manufactured by Poulan Pro, the P54ZX is the older brother of the 46ZX mentioned above. It has a lot of the same features, but with a 54 inch reinforced deck instead. This deck makes it cut much wider swaths of grass and allow the mower to cut at a rate up to 2.8 acres per hour. It also contains an upgraded engine that packs 24 horsepowers rather than 22. Although you would expect faster and more aggressive speeds with a larger engine, the P54ZX runs at the same top speed as his younger brother. This is due to the heavier cutting deck and larger blade weighing it down. Its wheels are also larger and made of more durable caster wheels. With 18 inch rear wheels, the 54ZX can move over bumpy terrain with ease while still maintaining a zero turning radius. Other than those differences, it is essentially the same mower as the 52ZX. It’s yet another great mower from Poulan Pro and we recommend it to anyone who has a larger lawn than 52” can handle. With a cushioned, high-backed seat and spring suspension system, the Troy-Bilt Mustang is one of the more comfortable rides in this price range. It is also one of the most customizeable with 8 different height settings for the cutting deck and several different available attachments. 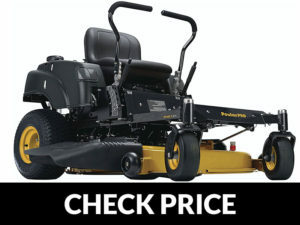 Along with a complimentary 3-year warranty on the entire vehicle and a lifetime warranty for the frame, this mower is easily one of the best at this price. 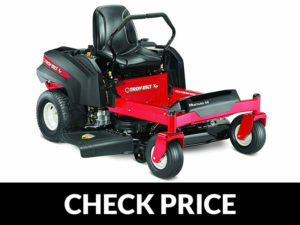 Troy-Bilt is known for having some of the lowest prices and some of the best mowers. This model is no exception. It manages to pack a hydrostatic transmission and 24 HP Briggs and Stratton for an extremely affordable price. It maneuvers precisely as if it were a much more expensive zero turn mower, but costs less than half the price. The seat is high backed at roughly 18 inches tall, and it’s great for supporting the back when mowing for extended periods of time. It’s positioned perfectly for reaching the controls, but also makes it kind of difficult to turn around – especially if you have limited back mobility. This model even manages to include premium features like electric take off for convenient blade engagement. These types of features are great for beginners and make this mower perfect for a first-time zero turn mower owner. Overall, Troy-Bilt’s Mustang mower is an amazing pick for those looking for performance without breaking the bank. Much like the model above it, Husqvarna is of absolutely exceptional quality. It is seriously the creme de la creme of mowers and will excite any lawn enthusiast. It features several patented components like Swisher’s “rapid response control system” to make mowing the lawn easier and more precise than ever before. Just like the previously mentioned model, Swisher’s 60 inch version is an absolute beast at cutting grass. It features the same engineering, and feels every bit as precise even with its larger size. To accommodate for the much heavier blade and cutting deck, the ZTR2760BS features a more powerful 27 Horsepower Commercial Turf Briggs and Stratton Engine. This allows the mower to move with the same haste as the 54” version. The steering column is tight and the center of gravity still defyingly low. Driving this mower truly will feel like a luxurious experience just like driving a premium car is a pleasure rather than a task. Overall, this is one of the best zero turn mowers on the market today. There are many advantages and disadvantages of owning a ztr mower. Below we have listed the most prominent ones. Reduced Mowing Time: A zero turn mower will be significantly faster than any other type of mower and can cut mowing time in nearly half. Precision Cut: With incredible turning capabilities, zero turn mowers can cut around even the most difficult obstacles. They will also cut extremely close to the edge, and trimming after mowing will rarely be required. Customization: Most models will have adjustable height settings for the deck and come with the option to use attachments like baggers, mulchers, and snow blowers. Intuitive Controls: Even though most models feature a unique two-lever system to control speed and direction, they are easy to learn and most owners have no issues after the initial learning curve. They also tend to feature a hydrostatic transmission which should eliminate any concerns regarding shifting gears. Costly: Again, ZTR mowers are the most expensive kind and buying a quality one will not be cheap. Although they require a large initial investment, their lifespan will be long with proper care and will easily recoup their price through saved time. Maintenance: The mechanical components of ZTR’s tend to be much more complicated than any tractor or pusher. Their use of a hydrostatic transmission requires many parts holding pressurized liquids, and these parts must be maintained regularly. Failure to do so will lead to early failure and wasted money. Size: Although exact dimensions will vary from model to model, most ZTR’s will be much larger than other types of mower. Before you make a purchase, make sure you have ample room to store your newly purchased vehicle indoors and away from unpredictable weather conditions. Struggles Uphill: The vast majority of ZTR models will house their engine in the rear-end which offsets the center of balance towards the back. This is not an issue on flat ground, but problems may arise on slopes exceeding 15 degrees. Make sure that you survey the property for any hills and purchase a model that corresponds with the needs of your specific terrain. Gas Guzzler: In order to produce the necessary power to run such a large vehicle, all ZTRs will have large engines, and naturally this equates to large amounts of fuel being burned. Why are are they so expensive? A commercial zero turn mower can cost upwards of $5,000 and for good reason. Due to their larger engines and wider blades, they are exponentially quicker at cutting grass than any tractor or pusher could ever be. The mechanical components involved in rotating the vehicle are also complicated and cost more to produce. For this reason, even the cheapest model will cost around $2000 which is roughly the cost of a solid lawn tractor. 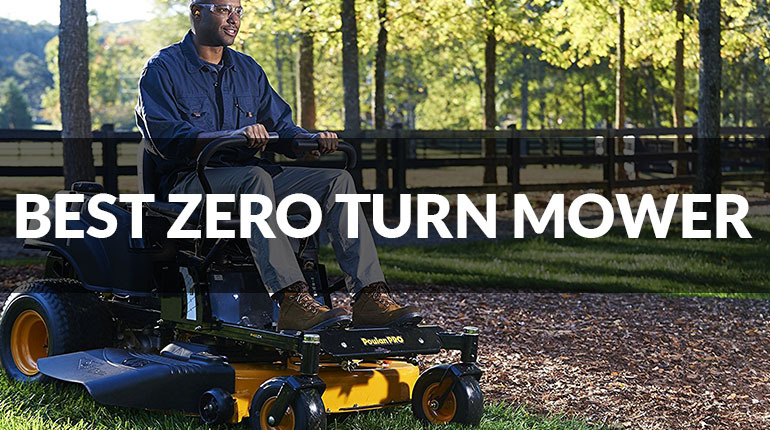 Although they are unable to utilize as many attachments as a tractor, zero turn mowers provide maximum efficiency when cutting grass and can cover much larger areas than other types of mower. Most will be able to use attachments like a bagging system to collect grass or a mulcher to recycle clippings into the surrounding area. Due to their large size and high pricetag, a zero turn mower is best suited for individuals with expansive properties that are at least an acre or more. They are most efficient at mowing big, flat areas with little terrain or obstacles, but a few obstructed areas will not be an issue. 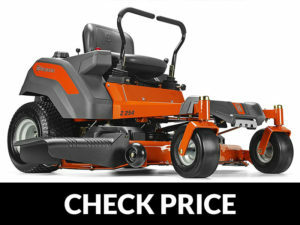 If you think that dropping a few grand on a premium zero turn mower is overkill, then make sure to checkout some mid-priced tractors which are more affordable and better optimized for smaller lawns. Purchasing a zero turn mower is a big investment decision for most individuals, and there should be several questions you ask yourself before buying one. The following questionnaire will break down the critical factors that lead to your purchase into a few short questions and will reassure your final decision. How big is my lawn? This question brings up the fact that a zero turn mower may be excessive for your specific lawn. Typically speaking, any lawn under an acre will not need such a large device to mow. If your property contains over an acre however, buying such an expensive mower may be justifiable as it will literally cut hours off of the time required to mow. Remember that if your property is flat and plain with little other than turf then a zero turn mower will be a perfect match. Can I afford one? The average model will cost upwards of $2,000 with the middle market being around $3,500. At that price range you can expect to have a well-built mower designed specifically for a smaller, private setting or roughly 1-5 acres of land. At $5,000+ you will enter commercial territory with massive cutting decks of over 60” and top speeds of 10+ mph. These are intended specifically for landscaping businesses and other commercial enterprises, but private owners with substantial property may want to consider one as well. Do I have enough space? To maintain steady use over a long period of time, these vehicles must be kept indoors inside a shed or garage. Storing one outside under a tarp is also a viable option, but the longevity of the mower may be adversely affected depending on weather conditions. The average mower will be roughly 6’ x 6’ give or take a foot or two. How long will I need it? Most of these mowers come with extensive warranties that insure several different parts for up to a decade or more, and therefore, you should plan to keep this investment for many seasons to come. If there is any chance that you may move in the upcoming years, then buying a multi-thousand dollar mower may not be the best option for you. What are the alternatives? If your lawn is less than an acre or just a little more, then a small riding mower is probably the better fit for your needs. They will be significantly cheaper and come with additional features such as easy steering and the ability to use attachments. Not only that, but they will mow quicker than the average pusher while being notably more comfortable as well. If you plan on moving in the upcoming years and your property is too large for a regular mower to accommodate, try to find private landscaping companies in your area. Hiring a crew to mow your lawn on a scheduled payment plan will most likely cost less in the short run and be more convenient than buying your own zero turn mower. Engine: The size and efficiency of the engine will have the biggest impact on the mower’s performance. A better engine will provide more power to the wheels and blade which translates into more proficient cutting. The engine’s power combined with the vehicle’s total weight will also dictate how quickly the mower can move over grass. A quality engine will provide the user with more precise control over the throttle and will feel smoother overall. Transmission: Most zero turn mowers will feature a hydrostatic transmission that requires little user intervention to handle. While usually never seen in common vehicles like automobiles, hydrostatic transmissions allow mowers to be operated through a wide range of speed continuously without the shifting of gears. They almost always provide greater acceleration and power than a manual or auto transmission, but come at a higher price as well. Their expensive nature is easily attributed to their complicated mechanical components that involve a hydrostatic pump to move pressurized oil into the engine’s pistons. Due to their intricate nature, they require more maintenance than other transmission types and fail more readily as well. For this reason, it is critically important to find a model featuring a high-quality transmission that is unlikely to break and under warranty. 46”-52”: Although some models will feature decks as small as 42”, these mowers will tend to be unbalanced when going up hills. Considering most ZRT mowers house their engines in the rear, a steep slope could potentially cause smaller mowers to flip. A mower in the 46”-52” range will be optimal for 1-3 acres of turf, and will need an additional half foot plus the deck’s width between alleyways to accommodate the discharge chute. 52”-56”: Depending on the price you pay, these mowers will be designed for either private or industrial mowing. A more expensive mower in this range will provide a more even cut and more precise control than a cheaper model which will tend to be harder to maneuver due to the larger deck size. 56”- 60+”: These mowers will almost never be meant for private use unless the property is well over 3 acres. Most buyers will be professionals in the landscaping industry or contractors looking to rent the mower to other landscapers. Almost all the models in this range will be extremely pricey and more expensive to maintain. Zero turn mowers are great options for property owners who own an acre of land or more, but for most people, a simple rear engine mower or tractor is probably the better choice. This is simply due to the fact that ZTR’s are extremely costly and require more dedication and money to maintain properly. Although they will mow lawns nearly twice as fast as the average rider, their superior cutting performance comes at the price of versatility as they are usually incompatible with many attachments. Before you attempt to purchase a mower, make sure you survey your land carefully and take measurements of clearings, alleys, and slopes. Remember that a more expensive mower will probably be smoother to operate and have a longer lifespan. For this reason, its important that you research your decision heavily before making the final call. Q: Do I need a high or low power engine? A: If you have to cut tall or wet grass on a frequent basis then you will need a higher powered mower (180+cc/30+V). For standard lawns without many weeds or hard to cut grasses a low power motor (140cc+/20+V)will suffice. 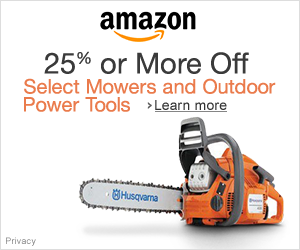 Q: Should I buy an electric or gas powered mower? A: If you have a lawn you can mow in 30-45 minutes or less (small lawn) then an electric mower will be quieter and more energy efficient. If you have a larger lawn (takes 60+ minutes to mow) a gas powered mower is a better option, because it will not run out of gas during the job. Q: How much faster will I be able to mow my lawn? A: It will all depend on the size of your lawn, but if you believe it takes way too long to mow your lawn, get an insulated vacuum tumbler like the Yeti to have an ice cold drink all the way through.